Recipe: Layered Apple Cinnamon Coffee Cake – Recipes & Food Writings. It’s fall y’all! And that means time for apples and pumpkin and warm spices like cinnamon, cloves, and nutmeg. I will admit that I am a fanatic for the apple cinnamon combination. So when my coworker gave me some Braeburn apples from his tree and asked me to do something with it so he could have a recipe, I knew exactly what to make. This coffee cake looks amazing and it doesn’t take much time to make. It’s best served warm, so it’s perfect for breakfast with a hot cup of coffee or a delicious dessert with a scoop of vanilla bean ice cream. 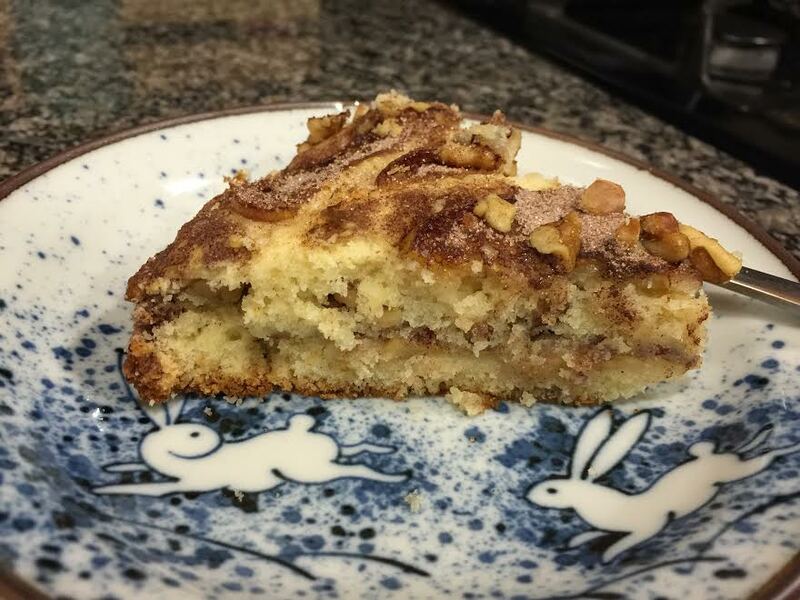 And contrary to its name – there is no coffee in this coffee cake. The ingredients are pantry staples – vanilla extract, white sugar, baking powder, salt, flour, butter, egg, milk, cinnamon, and apples. Things start off with creaming together white sugar and softened unsalted butter until it’s light and fluffy. Then you mix in an egg. 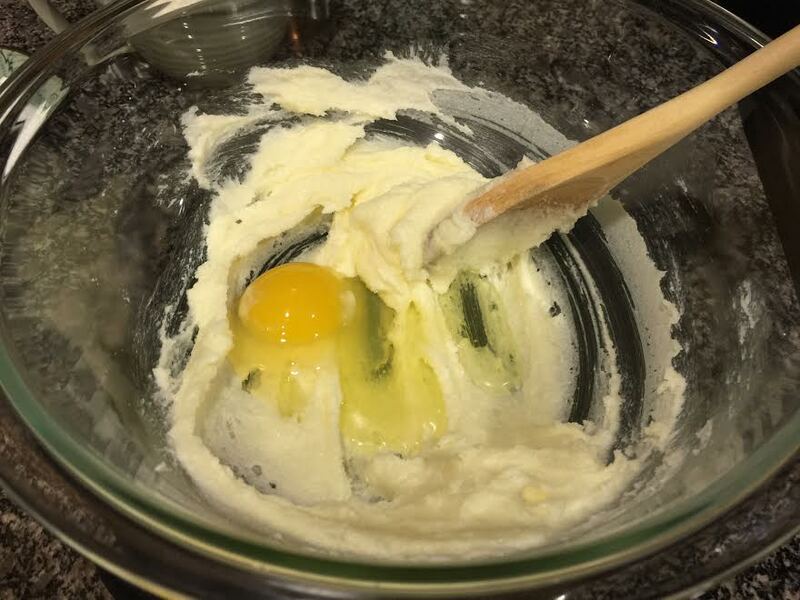 Once the egg is mixed in well, add the vanilla extract, baking powder, and salt. Mix until it’s thoroughly combined. Next, add the flour in two additions. And once that’s mixed together, add in the milk and stir until you’re left with a smooth and thick batter. 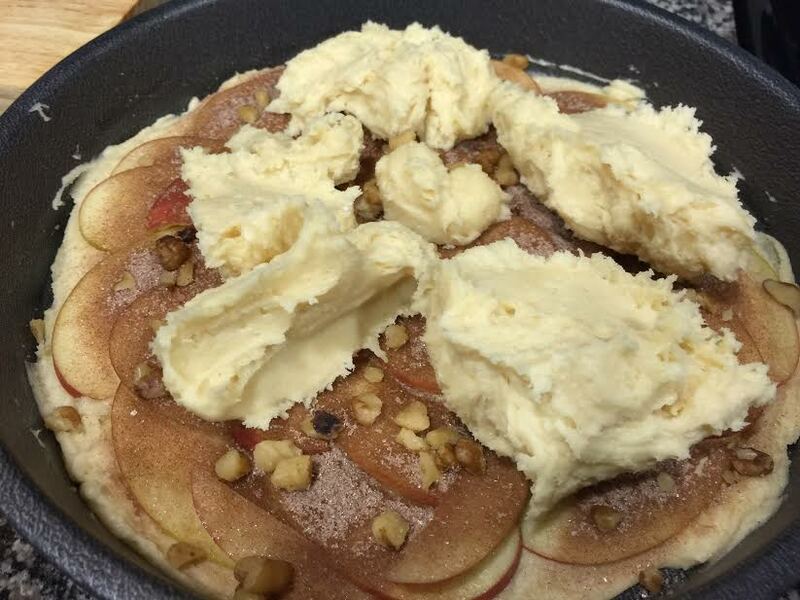 Once the batter is completed, set it aside and work on your apples. You can use any type of apples that you wish – just make sure that they can hold up to baking and are on the sweet side. I recommend using either Braeburn apples or Fuji apples. When you pick them up in the store, make sure that they are firm. 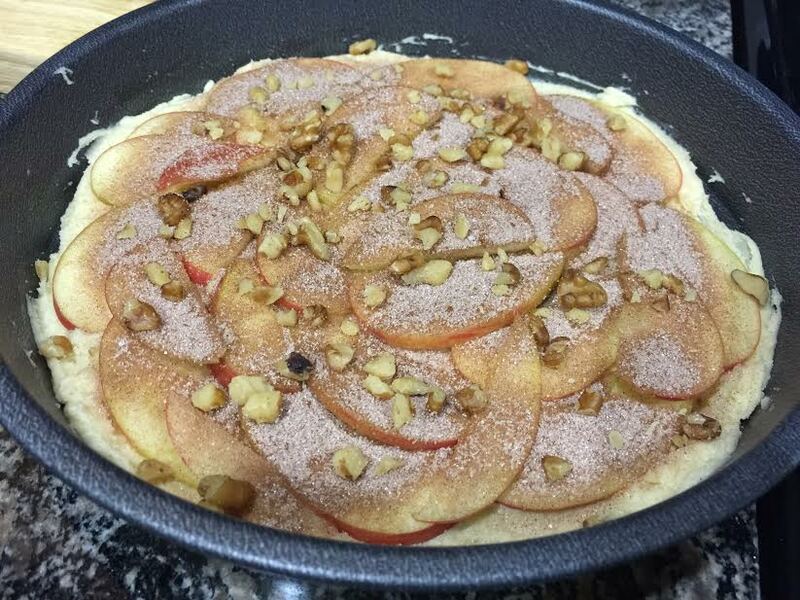 You could use Granny Smith apples if you want, but they might be too tart for this recipe. You’ll only need about one medium sized apple, or two small ones, for this because you’ll be using the whole thing. Wash your apple really well, then cut it in half and take out the core. 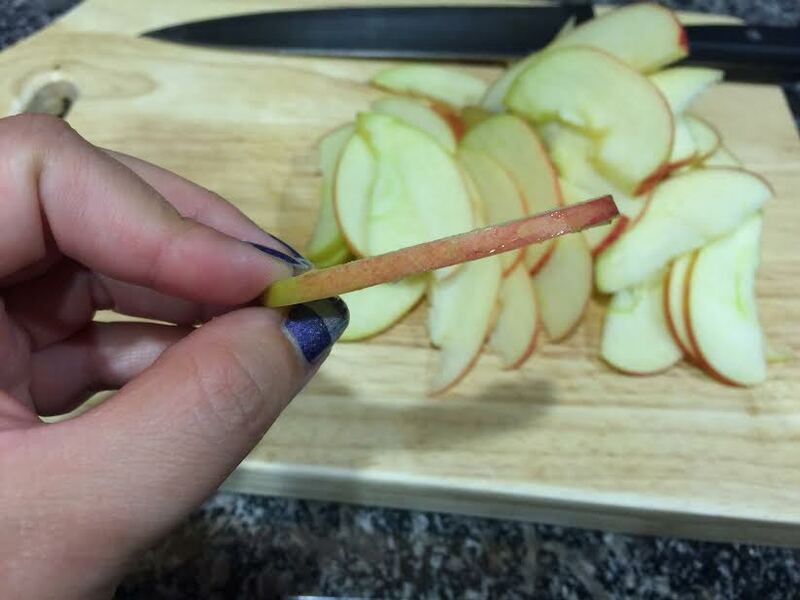 Once the core is removed, slice the apple into quarter-inch pieces. The slices shouldn’t be too thick because they’ll need to cook up quickly with the cake. When the apple is sliced up, it’s time to build the cake layers! 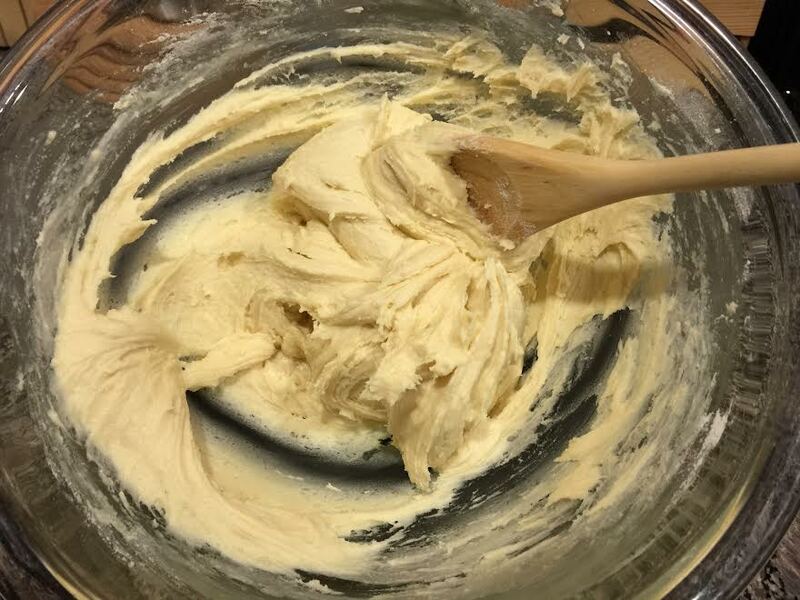 Take half of the cake batter and spread it on the bottom of a round cake pan lightly greased with non-stick spray. The batter doesn’t have to touch the edges of the pan and there can be holes and gaps in places along the bottom. It will expand and even out once it’s baking in the oven. 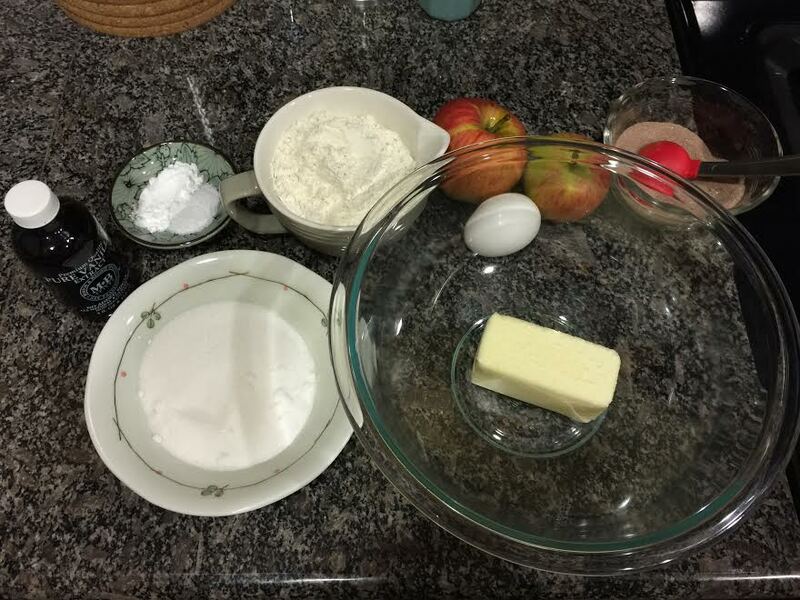 Next, you take half of your apple slices and arrange them in a layer over the batter. You want some of the slices to overlap, but also leave some gaps for the batter to fill. Next, sprinkle half of the cinnamon-sugar mixture over the apple slices and batter. Then top with a sprinkling of nuts (I recommend walnuts or pecans!) if you wish. Put the rest of the batter in dollops around the top of the cake. Carefully spread out the layer to cover most of the apples. It’s going to take a little bit of work and I found it’s best to work with your hands to do this step. 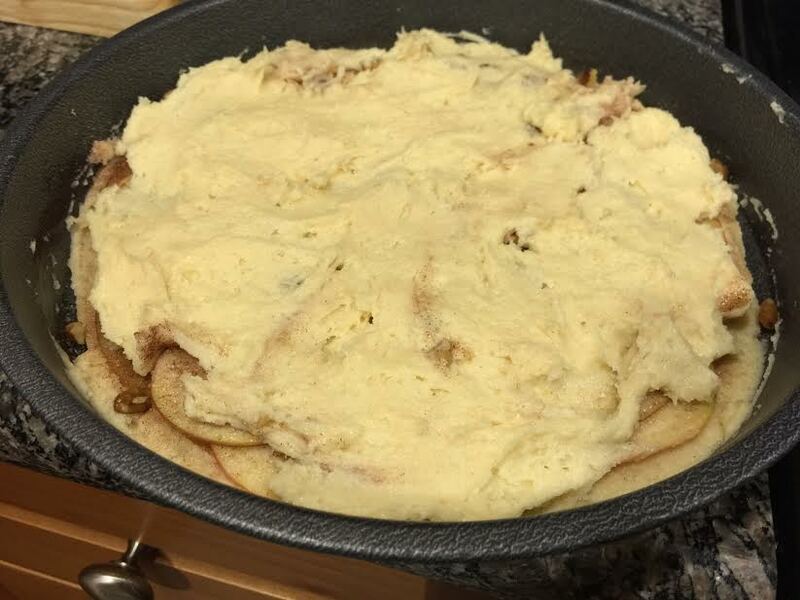 Remember that it’s okay to have gaps and holes and the batter isn’t supposed to go to all edges of the pan. Just ensure that most of the apples are covered. 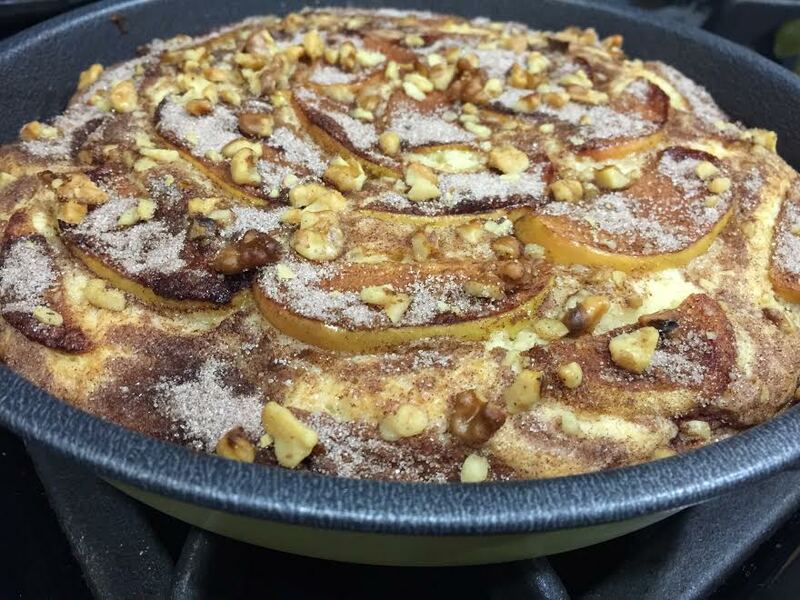 Once the batter is spread out, top it with the remaining apple slices, cinnamon-sugar mixture, and add another sprinkling of nuts if you’re adding it to your coffee cake. Then you put it in the oven and bake it! When it’s done baking, a toothpick inserted into the cake should come out clean or with a few moist crumbs. 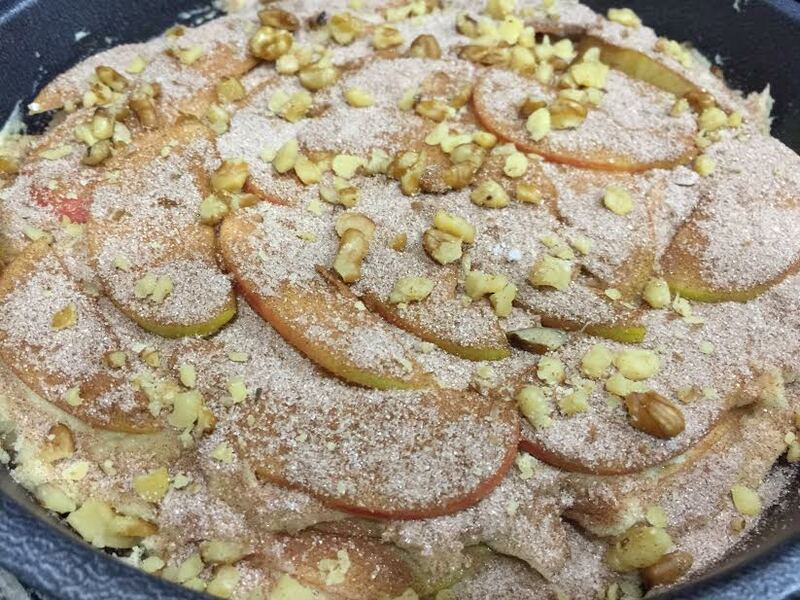 The apples are soft and tender, the cinnamon and sugar has melted into the apples and cake, and the nuts add a nice textural difference in the buttery cake layers. Let it sit in the pan for at least 10 minutes, then slice it up and serve! 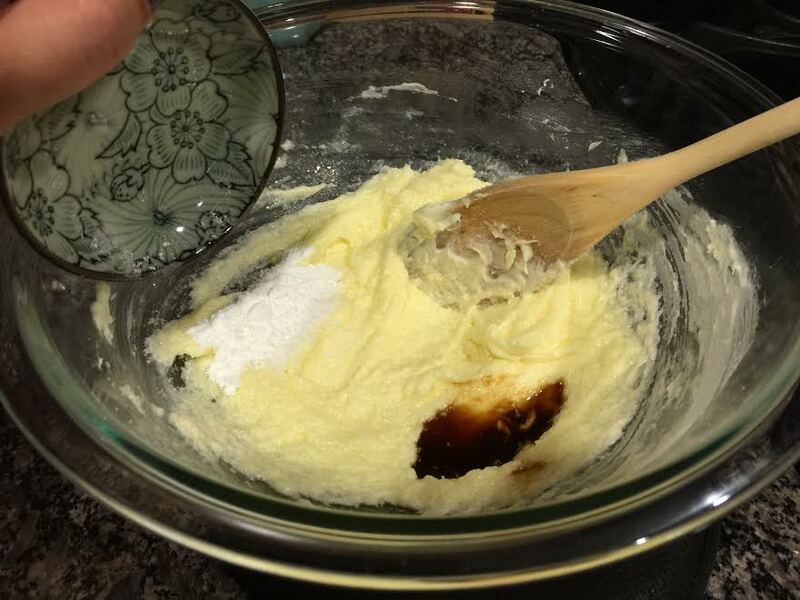 Cream together the butter and white sugar until fluffy. Mix in the vanilla extract, baking powder, and salt. 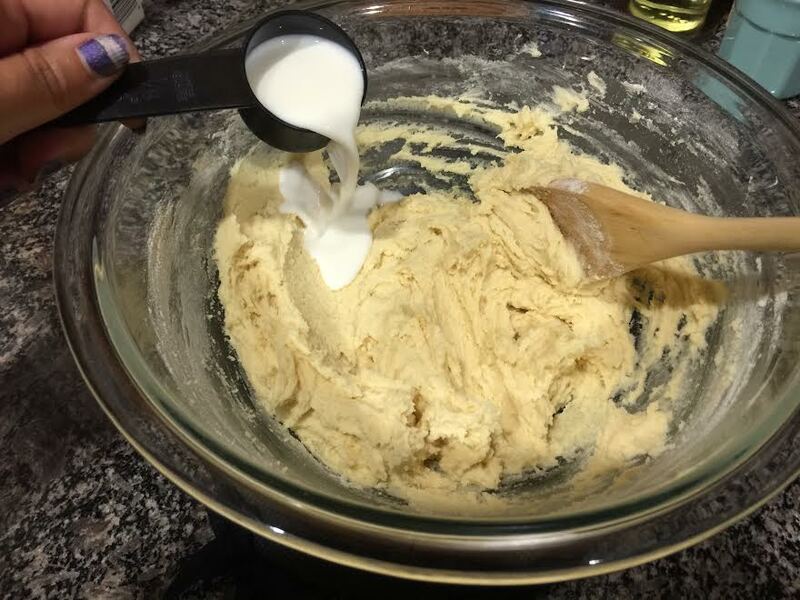 Add in the flour in two additions, mixing well until there’s no dry spots in the batter both times. Stir in the milk until well combined and set the batter aside. Wash the apple and pat dry. Cut the apple in half, then remove the core and seeds. 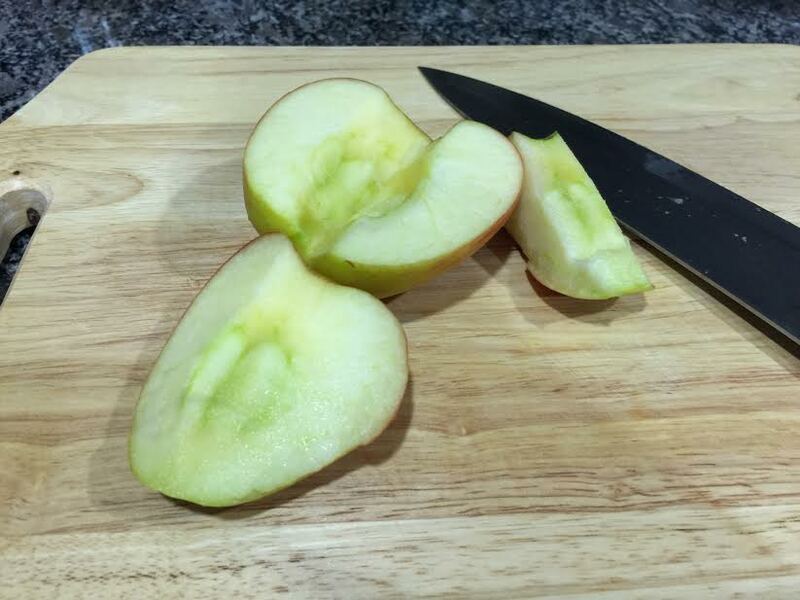 Slice the apple halves into thin pieces about ¼ of an inch thick. Lightly spray a 9-inch round cake pan with non-stick spray. Take half of the cake batter and spread it over the bottom of the pan as close to the edge as you can. 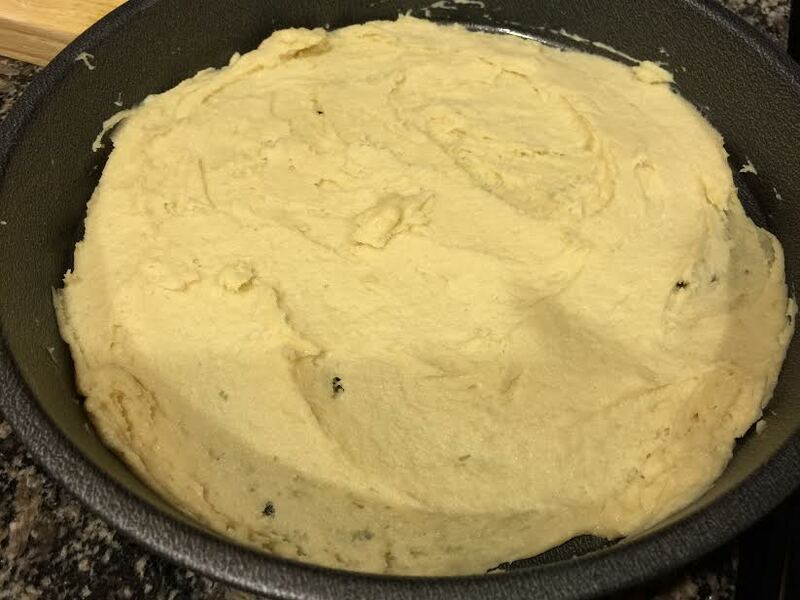 The batter will be thick and take work to spread, but it won’t cover the entire bottom of the pan evenly. It’s okay if there are holes or gaps, those will fill up with the cake when it’s baking in the oven. 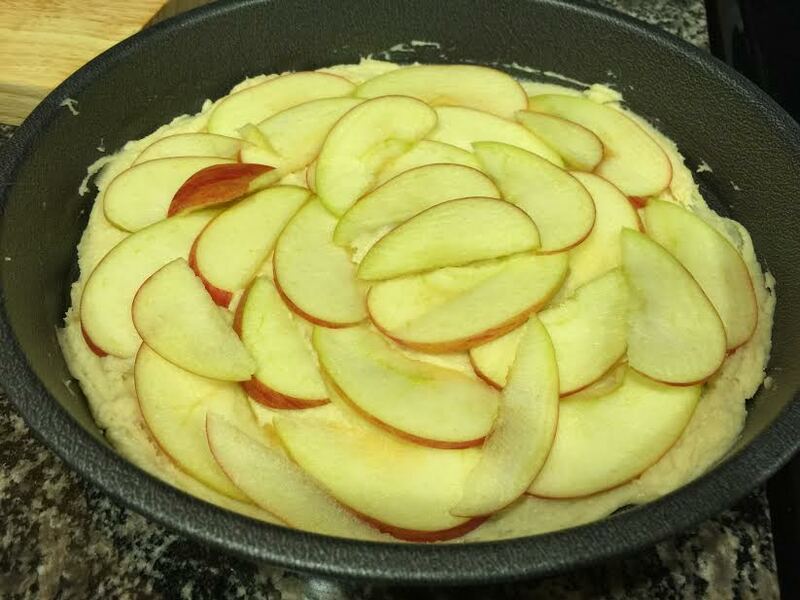 Layer half of the apple slices onto the batter, then sprinkle on half of the cinnamon-sugar mixture. You can add a sprinkling of nuts if you want them in your cake. Dot the remaining batter over the apple slices and using your fingers, spread out the dough to cover as much of the apples as possible. Not all the slices will be fully covered and that’s okay. Top the batter by layering the remaining apple slices, then sprinkle the remaining of the cinnamon-sugar mixture over them. Add another sprinkling of nuts if you’re adding them to the cake. Bake in the oven for 25 minutes. A toothpick inserted into the middle of the cake should come out clean or with very few moist crumbs. Let the cake cool in the pan for 10 minutes, then serve. It can be kept on the counter up to a day after baking, but should be stored in the refrigerator in an airtight container after that. Next Post Recipe: Sweet Potato Cake with Cranberry Orange Relish.